The risk of Weapons of Mass Destruction materials falling into the hands of criminals continues to be a major security concern following 9/11. Efforts to curb the threat culminated in 2004 with U.N. Security Council Resolution 1540. Resolution 1540 created an international institution—the 1540 regime—that was intended to prevent WMD proliferation by closing legal gaps in every U.N. member state. In addition to prohibiting states from engaging in proliferation activities, the instrument obliges states to address WMD trafficking at home through both criminal law enforcement and regulatory oversight. Since its creation, scholars and policy makers have come to view 1540 as an important foundation of the global nonproliferation and counter-terrorism regime, in part because 179 states have submitted domestic implementation country reports, and on average, countries report more than 145 new or existing domestic measures to comply with Resolution 1540 obligations. Yet, despite the alleged success of the 1540 regime, there are still gaps in the system. Drawing on fifty-two in-depth interviews, fieldwork, and observation data, Sarah Shirazyan’s article presents a novel assessment of the 1540 regime’s development and performance. 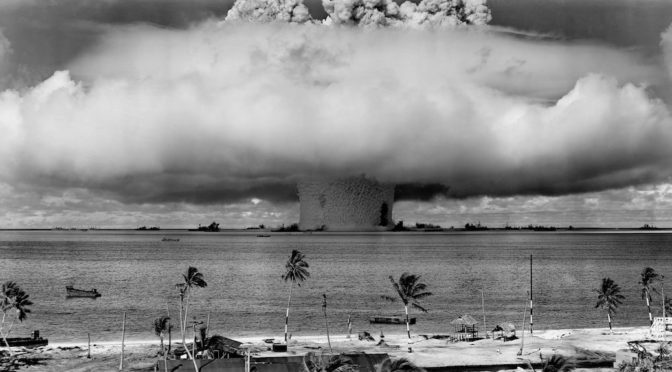 Sarah Shirazyan’s article on “Building a Universal Counter-Proliferation Regime” proceeds in four steps. First, it provides an assessment of 1540’s origins and its past performance, based on the 1540 Committee’s own metrics of success. Second, it demonstrates the regime’s weak performance, examining its effectiveness and accomplishments thus far. Third, it explains how the creation of the 1540 regime and its early institutional choices shaped its current structure and performance. In particular, how 1540’s legitimacy-building strategies have constrained the institution’s ability to effectively manage the implementation of the resolution. Finally, the article briefly explore options on how to strengthen 1540 regime to halt non-state actor proliferation. The world's only peer-reviewed journal devoted exclusively to national security law and policy. Welcome to JNSLP! Browse articles from our latest issue in the carousel; use the main menu to search for articles by issue number, topic, or author; or search by keyword below. Vol. 10, No. 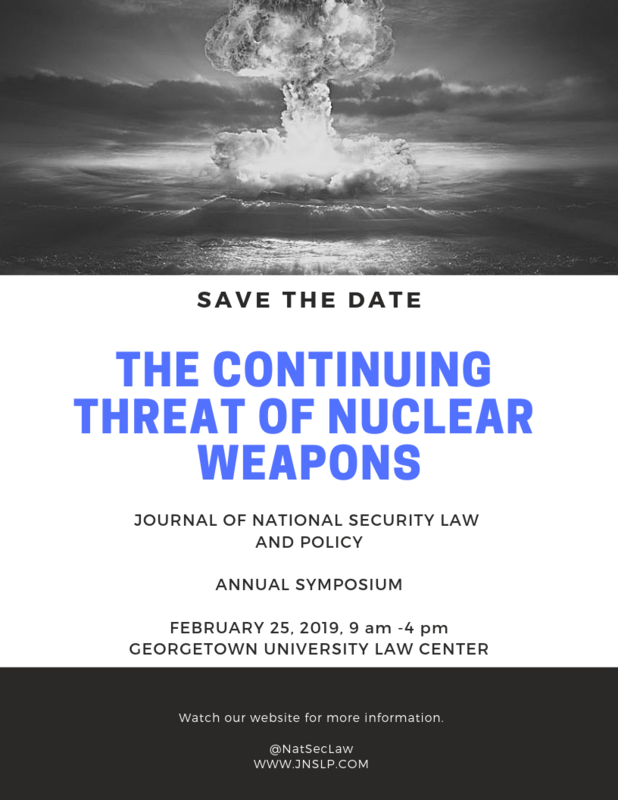 1 of JNSLP features articles spanning nuclear non-proliferation to the role of human behavior in national security decision-making. The issue opens with a critical look at the development and performance of the UN Security Council Resolution 1540 regime. 10:1 also includes an analysis of the conflicting and unclear state of authorities within the Intelligence Community, an article examining the role of the “prominence effect” in national security decision-making, and an overview of the US military’s position on climate change. 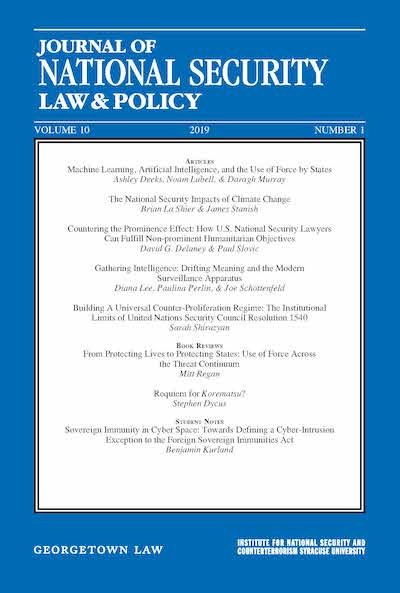 10:1 also provides perspectives on issues related to emerging technology, including a proposal for a new exception to the Foreign Sovereign Immunities Act to address the cyber threat and an overview the potential legal, policy, and ethical challenges that will arise as governments inevitably begin to employ artificial intelligence and machine learning algorithms to inform their use of force decisions. Two book reviews examine Professor Eric K. Yamamoto’s timely book In the Shadow of Korematsu: Democratic Liberties and National Security and retired Brig. Gen. Kenneth Watkin’s new study, Fighting at the Legal Boundaries: Controlling the Use of Force in Contemporary Conflict.